Singaporean iPad, iPhone and Android Blog: Gameloft announces surprise sale starting from Feb 24th: 30 apps for $0.99 each. 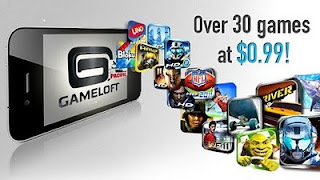 Gameloft announces surprise sale starting from Feb 24th: 30 apps for $0.99 each. Gameloft has just blogged about their surprise app sales (grab them while you can!) starting yesterday (Feb 24th). Their blog post is over here. Now, Gameloft has always produced high quality games and there’s a little rivalry going on between them and EA so this announcement is to be expected given that EA recently had a sale. The list of Gameloft offers on sale for the iphone is pretty cool and I am sure there is something for everyone. Again, it is for ‘a limited period only’. There’s also quite a few apps for the Ipad that you might want to pick up. My top picks would be: Real Football 2011 (that’s soccer), Star Battalion, NOVA, NOVA 2 HD, Dungeon Hunter HD.